Where and How much to spend on Mehendi Decor Props? So you know how much I love finding a jugaad when it comes to weddings. Everything is easy and accessible if you have the moolah to spend, but what if…that’s not the case. What if you still want a fabulous wedding but don’t have a wedding planner budget or the means to buy those expensive exquisite looking props? Well no worries. I am here to help you out a little bit. Consider this as an inspirational post. I am going to type out exactly where you can find the stuff for what price, so you know just how much its going to hit your pocket. Diwali is soon approaching, and while I absolutely detest the noise, I love everything else that comes with it. From colorful diyas, to kandils, lights, crafts and more…the market just changes overnight. And this is your time to splurge on some of these otherwise expensive mehendi decor props. Every mehendi event has these. Rightly so, because everyone mostly sits on the floor while applying mehendi and it gets quite back breaking after a while. Enter colorful cushions. They look fun, and add a whole lot of dimension to any mehendi decor. But cushions are expensive? Right? Go to any mall store like home centre etc, and it just is not possible to buy that many. So what to do? How much: Small ones (10 inch) cost 150 bucks for 5. Big ones (16 inch) will be 200-250 for 5. The really big ones…22 inch thingies cost 200 a piece. Just buy yourself a glue gun and make the cushion covers yourself by cutting a piece of a colorful saree or a dupatta. All you have to do is glue it up…Check out any you-tube videos…and its really simple. You can add some latkans on the side to give them a personal touch…and the best part….you don’t need to throw these away once the function is over…just use it in your new home. Easy no. Read it everywhere? But its true. You can do wonders with this piece of clothing. Mehendi is all about colors, so the more crazy you get with bright pop of colors the better. 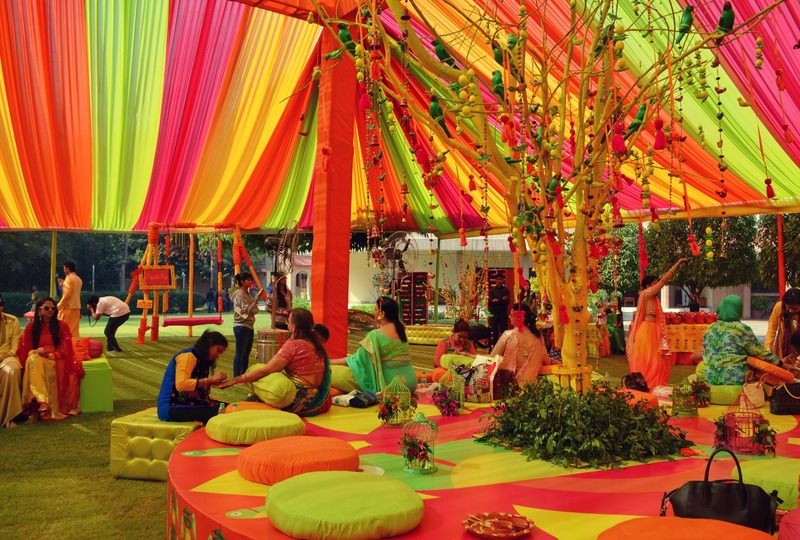 A colorful venue for wedding may be a bit much…but everyone wants and likes seeing a sunshine mehendi decor. So think pink, orange, purple, yellow, green…in bright shades. I was recently out (window) shopping in Delhi, and I came across this lane where you get all kinds of furnitures and frames…the colorful ones…the whole street looked like it was meant for wedding decor. These may seem expensive to you…but pick it up from the right place…and you will save yourself a ton of decorator money. How much: 200-300 bucks at max. If your budget permits, then go ahead and buy more colorful frames. You can put it up together in one corner, making it a full on photo booth section. Now, these can be in any type. From paper lanterns to diwali kandils…the market is flooded with these gorgeous items. Depending upon your budget, you can either mix and match or stick to one prop lantern that fits your budget. They look super adorable, and you can simply ask your decorator to hang these up. If lanterns feel like a cost to you, which I agree it is…then balloons is the cheaper alternative. Pick out the good looking bright colors, and you can do wonders with this mehendi decor prop. How much: 50 bucks a packet may be? Nowadays you even have standalone stores for balloons…those hydrogen/helium balloons which stay up in the air all the time. Those cost a bit more…but not that much when you actually think about the overall cost. You get lots of colors, shapes, patterns and sizes…so may be give them a look as well. The idea is to mix up a few props to get that perfect pinterest worthy mehendi decor. So it doesn’t necessarily have to be all expensive. You can buy a few balloons, a few paper lanterns a few cushions and so on. Just work it out based on your need and venue space. Kites are good to buy when the season permits. I honestly don’t know where to pick these off season. So this is more of a good to know bit that you keep in mind, in case you want to include in your decor. Bangles are symbolic with Indian Weddings, and it is but natural to include them in your wedding decor as well. Mehendi decor to be specific. From hanging it up on tree branches to tying it up in a string…you can do anything with bangles. Just make sure you buy loads of colorful ones. I especially love the glass ones. They really glitter when the lights fall on them. These strings are mostly used in home decor, where you can either put it up outside the main door, or even in your balcony. I for once, have used in my main dining area as well. I love the colors, its very ethnic in its look…and you get several varieties to pick from. From elephants, to peacocks…even Ganesha…depending upon your theme choose to put up these strings at the edge of the dupattas…or even use the smaller ones to tie the dupatta knots. It will look super cute. How much: 50 bucks for paired small ones, 100 for long. Total Cost: 300-400 at max. Satin ribbons are the best…You can simply make a photo booth section by just hanging strips of satin ribbons.Add a few frames and other props next to it…and viola, you will have one hell of a mehendi decor section which will be completely DIY all to your credit. I love these guda-guddis. They come in different colorful dresses and sizes and make for the perfect mehendi prop. Its just that I think they are a bit expensive. So in case, you don’t want to splurge…may be give this a miss. Next, click pictures of the props – how they are used. If you want the same kind of look as the ones in the above photos…click these pictures and keep for your reference. Catch hold of skilled laborers. Could be anyone who might be working your wedding…including some male members (cousin) etc who might be willing to help and are upto the task. Walk with that person a week before to the venue, and finalize where you want what. Carry the samples with you…just so the person gets the feel of things. Get a ladder, a tape, a scissor, glue stick. Keep all these supplies ready. Make a handy bag, and put the pictures in a folder. Hand over all the work to the person and sit back and enjoy your mehendi function ! If after reading all this, your ‘friend’ is having second thoughts, then check with your decorator to get you a laborer for a days work. He might charge 500-1000 bucks for the day. Make your friend the supervisor and get the job done.